ttt for some more pics!!!!!!!!! Always wanted a mount of a doe eating an apple with the juice dripping out the sides of her mouth. Now there's a challenge for you Curt! I'll take pix as I do the finish work this weekend and post as I go. He looks GREAT!!!!! 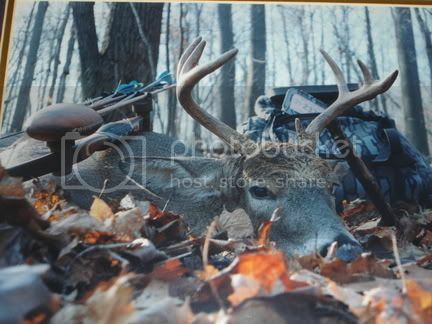 If I'm ever lucky enough to shoot a buck like that,you've got the job!!!!! Stunning Curt, amazingly life like. 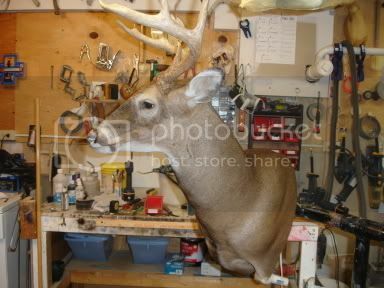 Even without the finish work completed, this mount looks better than more than half of what a lot of folks are selling. 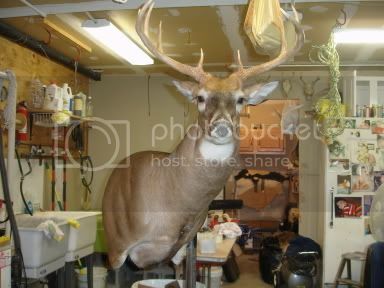 Not only is this a great thread, but it also serves the purpose of educating hunters in terms of what to look for when deciding whether or not to leave their hard-earned trophy with a Taxidermist. I've always felt that it is better to pay more $ for someone with Curt's expertise than to pay less and get less in return! Great job, Curt! Chuck,you got it bud,just let me know..
Claudia, Thanks girl,that was the reason for doing this,to try to educate some on what to look for. Ya really have to ask some questions and look close at what they have on display.Remember,you are going to look at your mount for the rest of your life.Waiting a little longer,or paying a little more is worth it in the long run.If you don't like what you see,go elsewhere.Keep looking till you find the right person for the job!! I used to think, "Huh. I could do my own head mount." I will never think that again. Wow. What an incredible amount of artistic skill you have to possess in order to complete such a masterpiece. Thanks for sharing that step by step instruction. 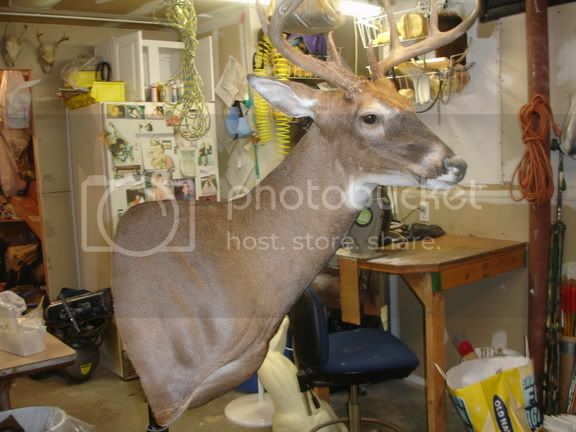 I will never complain about the price of taxidermy again. This guy really does look alive...and its an internet pic!!! Bet it looks even better in person. I'm gonna try to get it finished this weekend and you'll really see it come alive!! I'll get some good pix outside in natural light. Thanks for the tutorial and walk-through. Your work, attention to detail, and craftsmanship are superb. Kudos for all of the time you have dedicated to turn out these fine examples of "living art". Awesome work bro. My taxedermist decided he is not going to take any more heads. You need to move to Ohio, or at least come once a year for a hunting trip! Curt, I hope you don't mind some new business coming your way from NH, cause you got me hooked for sure. I figure I benefit a couple of ways from this, one I get a great looking trophy, two, it gives me an excuse to come to NY and visit! I wasn't gonna TOUCH Knifey's posts. Oh well, and I used to have such restraint.